When I first decided to write a book on writing (after blogging about the subject for a year and a half), the decision was not a difficult one. I had a vision of exactly what I wanted. It’s not that I believed myself capable of equaling their (arguable) classic work on grammar, style, and writing in general but rather I wanted to produce a book that was small in stature, large in OOMPH. A book one might keep next to the computer (or typewriter, for your sadomasochists). In fact, I priced the paperback as low as the distributor would allow (which means I make less on a physical paperback than a digital copy), all because I honestly believe, of all books, this is the one that deserves all the real highlight marks, dogears, and other signs of heavy usage over the years. There are enough readers for all talented writers (and even for some not-so-talented ones). 2) A product well worth their hard-earned money and time when we arrive there to present our work to them. I work diligently at helping with #1. Now I wanted to share what I’d learned through trials, hard knocks, painful red ink on the page, and some damned fine writers over the years so that a fellow author might sit with my book and use a few simple (call them what you will: rules, techniques, processes, guidelines) and come out the other side with a book at least twice as good as it was entering the makeover. Thus INK: Eight Rules To A Better Bookwas born. Not of greed; not of pride; not of chance. INK was born because I was destined to write it, and I promise you, those writers who’ve taken the time to read it (one self-proclaimed slow reader devoured it in three hours!) will learn a lifetime of lessons. And it’s a book you can read over and over again. Highlighting, coming back to a section you love or need or just wanted to get straight in your head. Writing is a process, and like every other skilled profession in the world, there are those to whom it comes naturally; there are great writers and good writers and decent writers and, yes, horrible writers. But I didn’t write INK for any one group. My theory is that no matter where you fall on the spectrum of ability or talent, your prose can always improve. None of us—nor non of “them”—is at the one hundred percent, don’t need to fix a thing stage. Lastly, the cover is intentionally simplistic, because I believe in the simplicity (and conversely, the POWER) of the eight rules. They aren’t rocket science and every single writer out there in the world can put them to use. 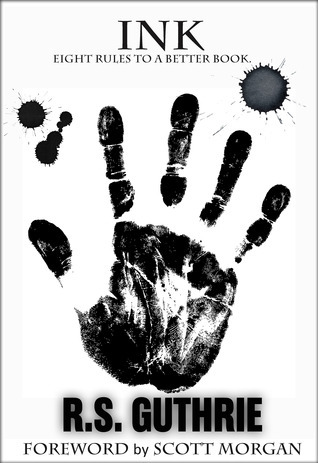 I also have an absolute reason for using the hand print in ink for the cover. It has come to represent the unique signature of every writer on the planet. Each of us is different in some way from the next. Like snowflakes. R.S. (Rob) Guthrie grew up in Iowa and Wyoming. He has been writing fiction, essays, short stories, and lyrics since college. Guthrie’s “Blood Land” is the first in the James Pruett Mystery/Thriller series and represents a project that is close to his heart: it is set in a fictional town in the same county where he spent much of his childhood and still visits. The sequel, Money Land, hit the shelves Christmas Day, 2012. Honor Land, the third in the bestselling series is due out in the Summer of 2013. Guthrie lives in Colorado with his wife, Amy, three young Australian Shepherds, and a Chihuahua who thinks she is a 40-pound Aussie! Pictured is Elsa, the oldest, the Alpha, crazy adorable and every bit the diva (and she knows it!). And yes, there is a Hero Dog book bursting to get out that Guthrie plans to write concurrently with his third Pruett book. A concise, personal read to share with you eight easy-to-implement strategies to make your book better. No gimmicks, no get rich quick schemes, just the lessons learned by a writer, writing personally to you (i.e. not a textbook or a collection of empty words and promises). INK transcends all levels of authors; no experience, experienced; published, unpublished; confident, scared-witless. It is a particularly noteworthy read to the beginning writer because it focuses on rules we’ve all made early on in our careers and what better time to pick up some learned education from someone else without have to stumble yourself? Seasoned writers with an open mind will learn a tidbit or two as well. This book is a sharing; a sharing of twenty-plus years of writing workshops, classes, flounders, flubs, successes, and all the information gleaned carved down into a fun, readable, get-to-the-meat, skip-the-potatoes, book you don’t want to miss. Be the best writer you can. Write the best book you can write. Make yourself and your product crisper, cleaner, more grabbing, more of a page-turner. We learn from our failures, which hammer future work into gems. We are in this together, we writers. Share your success with others. That is how this book is written: treating other writers as part of a larger collective where one can help the other to climb the mountain of success.